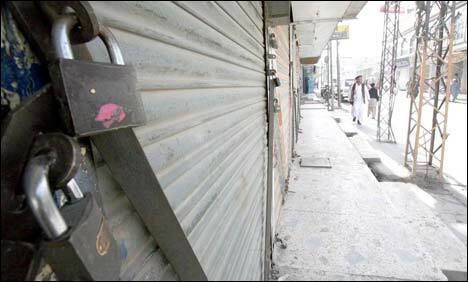 QUETTA: The city wore a deserted look after Hazara Democratic Party (HDP) called to observe a complete shutter-down strike Friday to condemn the target killings and Hazar Gunji bomb blast in Quetta, Geo News reported. All the business activities in different areas including Alamdar Road, Hazara Town, Toghi Road, Gulistan Road, Liaquat Bazaar, Bacha Khan Chowk and in adjoining areas were suspended while traffic was also thin on the roads. While announcing to support today’s strike, different politico-religious parties including Pakhtunkhwa Milli Awami Party (PkMAP) strongly condemned the Hazar Gunji blast and demanded the government to provide security to the general public or else step down. On Thursday, a powerful remote-controlled car-bomb targeting a bus full of pilgrims claimed the lives of 13 people, including a cop, and injured 30 others in the Hazar Gunji area. Police officials said a passenger bus, escorted by a police van, carrying 40 pilgrims, was on its way from the Pak-Iran border at Taftan to Quetta. When the bus reached the Hazar Gunji area in the outskirts of the provincial capital, it was targeted by a remote-controlled car-bomb. The blast was so powerful that the bus turned into an unrecognizable wreck of metal and all 40 pilgrims and four policemen – in a patrolling vehicle escorting the passenger bus – were hit. Reports suggested that unidentified terrorists had parked a car loaded with explosives at Hazar Gunji. As the bus carrying the pilgrims approached the site at around 6:00pm, the explosive device went off with a big bang.